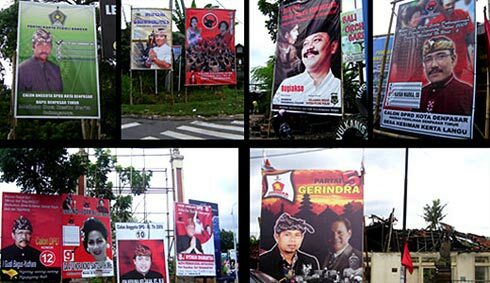 Big Banner / Baliho adalah Variasi dari billboard untuk waktu-waktu tertentu atau temporary Billboard biasanya untuk kebutuhan akan Promosi suatu event, launching atau campaign produk baru. Just landed on this post via Google seek. I love it. This situation switch my percept and I am fixing the RSS feeds. Cheers Up. goodinformation, many thanks to the writer. I enjoyed viewing your blog and I will be back to check it more in the future so please keep up your good quality work. I love the colors that you chose, you are quite talented! Hello, I am a design enthusiast and I think your website is very inspirefull for both rookies and advanced designers. I just became your fan! Good collection of work & excellent site! hey friend… i think your site is very interisting for me….. your site give me some important information.. thanks a lot! I think you may be right in what you have said here. Whoever there are many people will disagree with your opinion. Hey can I reference some of the material from this entry if I link back to you? Great info here, thanks for sharing . Frend! I like your sharing. really appreciate you ,thanks a lot! Good post, I can’t say that I agree with everything that was said, but very good information overall. I am Completely Concur with your oppinion.this blog post is very encouraging to Folks who want to know these topics. Thank you very sunny site. This kind of an amazing article! I really Take pleasure in Examining it, very Excellent insights, the article is very ell-Stated. A thumbs up! You ought to essentially glimpse into the brand upgrades available for BE blogs. I imagine yours may significantly profit from it. I enjoy your posts here but your Rss has one or two XML issues that you really should fix. Good post though! You ought to look into model new upgrades accessible for BE blogs. I believe yours may really profit from it. Wonderful blog! I actually love how it’s easy on my eyes as well as the information are well written. I am wondering how I could be notified whenever a new post has been made. I have subscribed to your rss feed which must do the trick! Have a nice day! Are available on and Maintain writting your blog will be more Desirable. To Your Success! Selamat datang di Bali Adpro advertising…. Copyright © Bali Adpro - Kami Bagian Dari Bisnis Anda. All rights reserved. Design by Bali Web Design.